History has a disturbing way of repeating. When I was working in my biotech job I was always amazed how literature tracked back decades and someone 50 - 100 years ago would be doing the same things as I was attempting to do with newer technology. Reading a 1930 paper about influence of food on longevity of life. Rats were feed a diet, called diet A, that had adequate vitamin intake. Thus these rats didn't have any signs of vitamin deficiency and grew normally. We would consider that the rat got their RDI of vitamins. However when the diet was changed to supply more vitamins and nutrients the rats lived longer. The graphs below illustrate this, again clicking figure makes it larger. 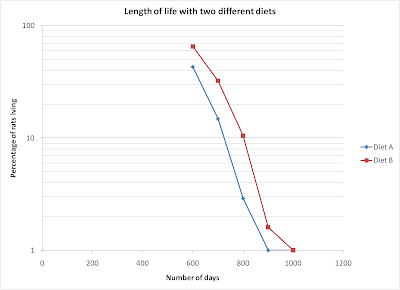 You can see that diet B which had more nutrients the rats lived longer. Interesting if we create a semi-log graph from the data we get the following graph. This makes the lines almost linear (straight line). 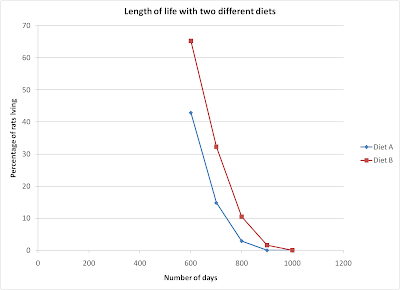 What this indicates is that the life expectancy increased by 100 days for the new diet. Thus this shows the dramatic impact that nutrition has on life expectancy. I suspect that the 70 gap between 1930 and 2000 when studies like this came back into vogue was caused by two things, one lack of appropriate technology and a narrow focus. Technology wouldn't have allowed the scientists to delve deep enough into the food composition to determine what factors extended the life span. Secondly scientists would have tried to isolate exactly what nutrient would be the cause of the increase in life expectancy. However it wouldn't be just one nutrient it would have been the complete set of nutrients and how they acted together.Thus isolation of one nutrient was bound to fail. So for decades this research would have ignored much to our peril.